The Samsung Galaxy Note7 is one of the first smartphones to come with Gorilla Glass 5, one that was announced last month. GG5 aimed to withstand drops from selfie-height. Fast-forward to this week, YouTuber JerryRigEverything performed a scratch test (as he always does) with his metal picks which are all individually representative of Mohs scale of hardness. Basically, anything with a higher hardness rating will scratch anything else with a lower rating. The Note7 didn’t do so well in the YouTuber’s video where it began to show signs of scratching at only at Mohs level 3 whereas previous Gorilla glass models have come in at 5 or 6. Android Authority interviewed the people over at Corning to discuss what could be going on with the Note7’s G.G.5 screen. 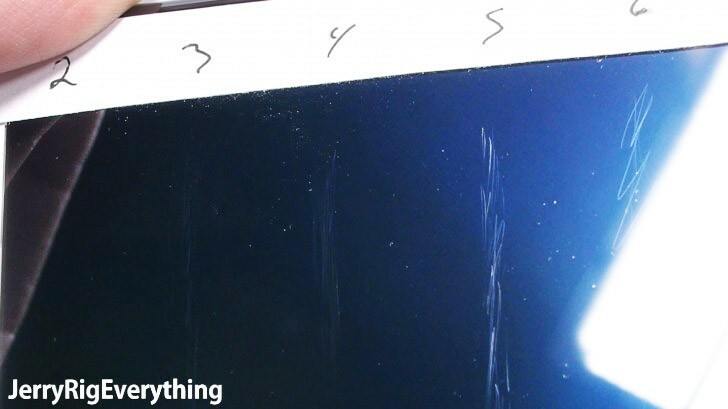 A higher risk of scratching could be completely possible with an improved shatter resistance. It would only make sense as a logical trade-off for glass to have the ability to absorb shock better at the expense of having "softer" glass. The interview goes on with Corning invalidating the YouTuber’s test (despite the somewhat consistent results with previous G.G. versions scratching at Mohs level 5 or 6). Saying that we don’t know what kind of load he used when scraping these phones with these picks. Corning now says that what we likely have seen on the video is likely to be “metallic transfer” Which happens when a harder material’s friction with a softer material causes the softer one to transfer onto the harder one. Corning’s full interview with Android Authority can be found at the source link below. The company’s overall tone is quite defensive, and its arguments are quite convenient. However, the truth is already out (and so is the Note7) so if Corning is biting its tongue with these arguments, the world will know sooner or later. For now, we could recommend that you use some kind of screen protector or a case to prevent the Note7 in case it is, in fact, more prone to scratching than previous versions. Do you think Corning is telling the truth or trying too hard to defend itself? well, that's unfortunate i guess. i bought mine on launch day one. from Dubai.